Removed by original poster on 01/13/19 - 17:46:17 (GMT). Here is my Start Photo. I had trouble loading it all resolved now thanks. Some progress with my Blackjack, so far a pleasant build, fitting goes well. 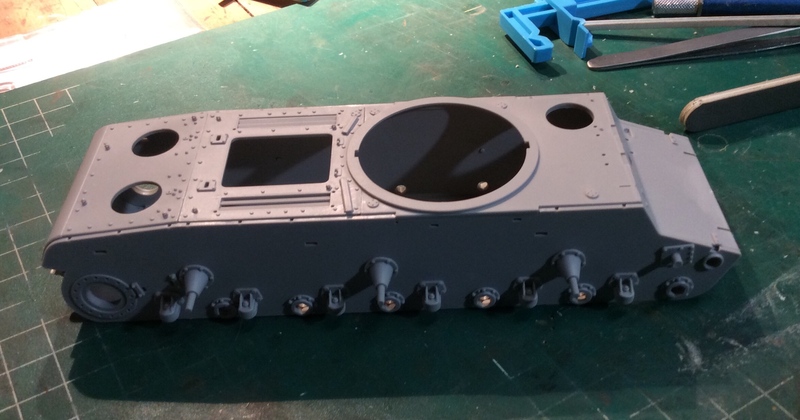 All sub assembly done. Getting ready for paint and the tracks. I just need a warm day to paint. Free up some room on the bench so can start with this group build. 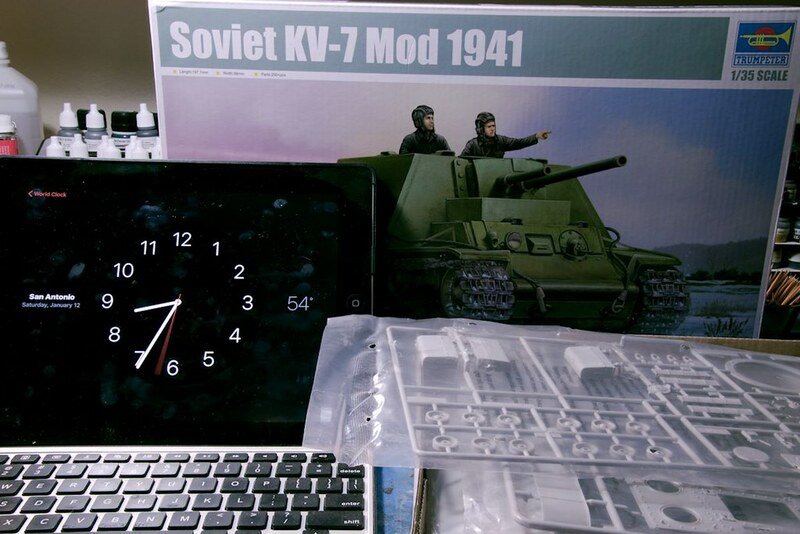 My entry is Trumpeter's kit #09503, Soviet KV-7 Mod 1941. Yes John, Thank you for this! 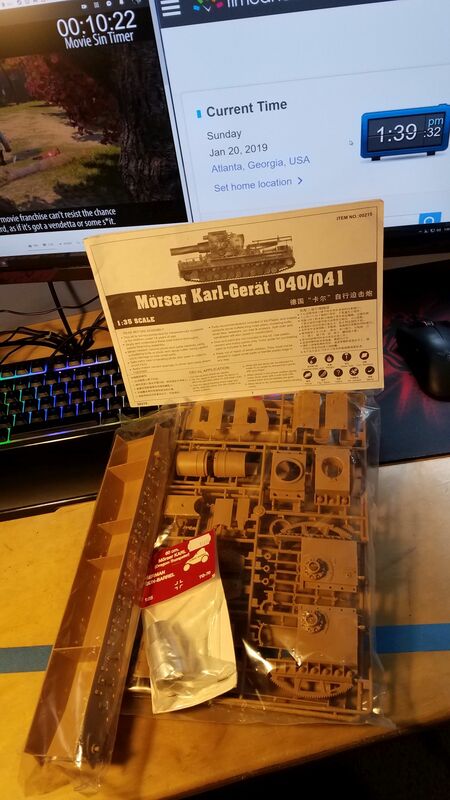 This is a great opportunity to finally build my T 34/76 in 1/16. Im currently in "Beat the Stash" mode, and that's the only Trumpy I have... excellent. I just need to pull it out and post the start pic. Eric that should build out nicely with all those goodies. Pasi That's some nice boxart, and should be a nice build too. Martin wow dude That was fun and done, and came out sweet! Trumpeter 1/350 S-100. First kit I have built that comes in a blister pack! I am adding some PE to spruce it up a bit. Kit is quite nice but not without some issues. Some filling needed to be done between the deck and hull. Also there were no location holes for the prop shafts so had to eyeball it. Think I got it looking ok. Basic hull is complete. Added a 1/35 scale Panther wheel for size comparison. This is a very small kit. Rory that's a small kit sure but it looks nice already! If I recall, doesn't Trumpeter offer a mind boggling selection of ship kits? They do have a nice varied selection from historical through to modern warships. Next update: It is a small kit with not a lot of parts so its going pretty quick. Hull is painted. Its hard to see because its so narrow but there is a boot line there. I have also added the photo etch parts. Not that many to add, mainly just railings and ladders but it really does add that something extra! Well I am calling this little guy done. A true weekend kit. I was really very very happy with this! Pics have been uploaded to the gallery. First Trumpeter kit for me. Looks like it should go fast. Removed by original poster on 02/05/19 - 00:27:04 (GMT). 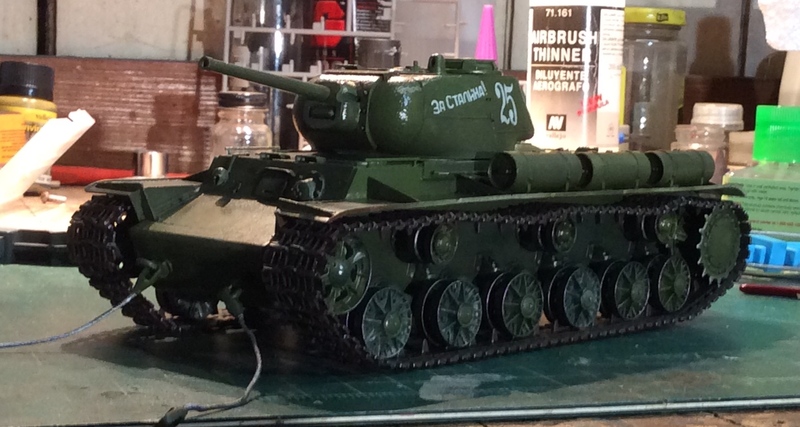 I have built the KV-8 and KV-1 from Trumpeter which are almost the same kit as yours and they went together very easily. They were some of the fun builds I have done in a while. Not many decals and because they had such a short life on the battlefield you don't have to go crazy with weathering. Step 1 done and almost complete with step 2. I have to agree aqs of now. This kit is falling together. I am enjoying. I have a question for you. 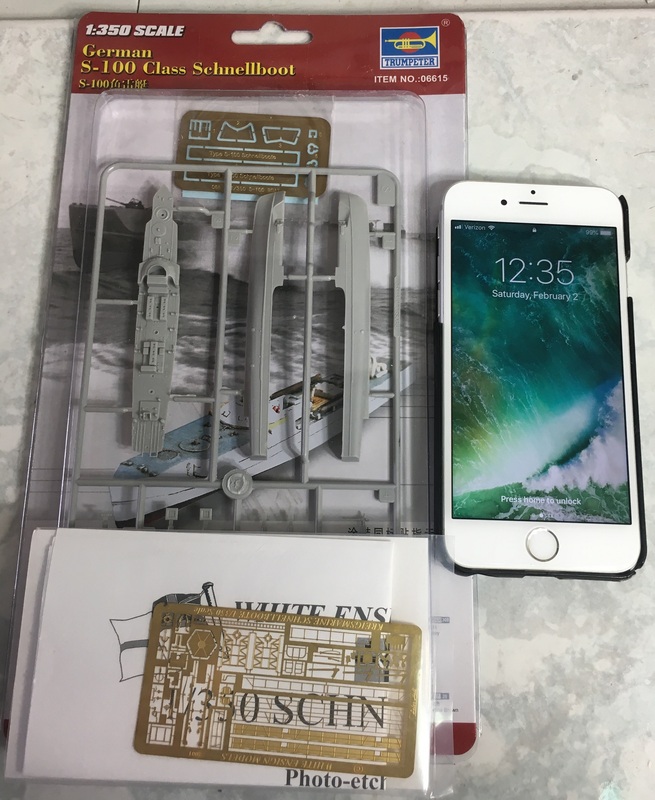 How are the indy tracks that came with the kit? Do they lock at all, or is it all glue that will keep them together? 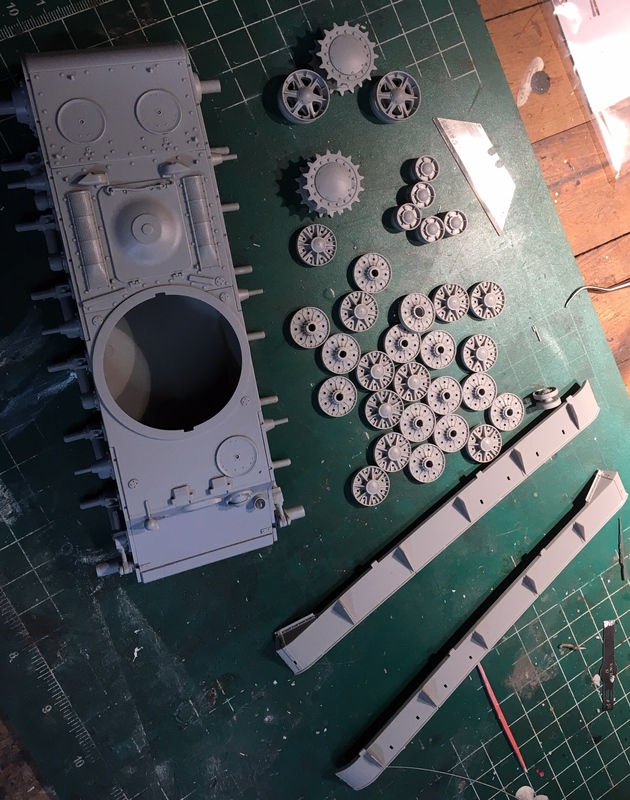 I got all the wheels de sprued. Ready to start painting them while i start the indy treads. I have the turret primed. Need to touch up a fews spots of the cast look, where i filled in holes. 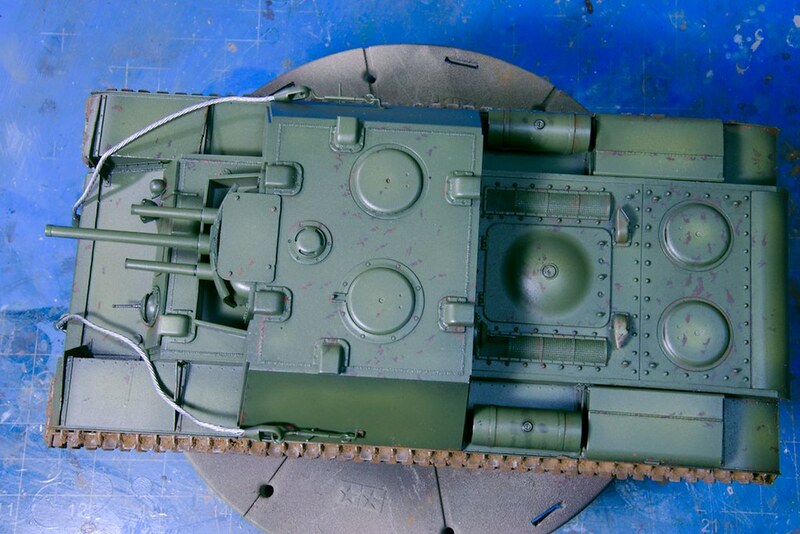 There was also a gap at the rear of the turret that needed filling. Wheels always take the longest to prep. I always feel that the build is on the downward slide to the finish after getting them prep and ready for paint. 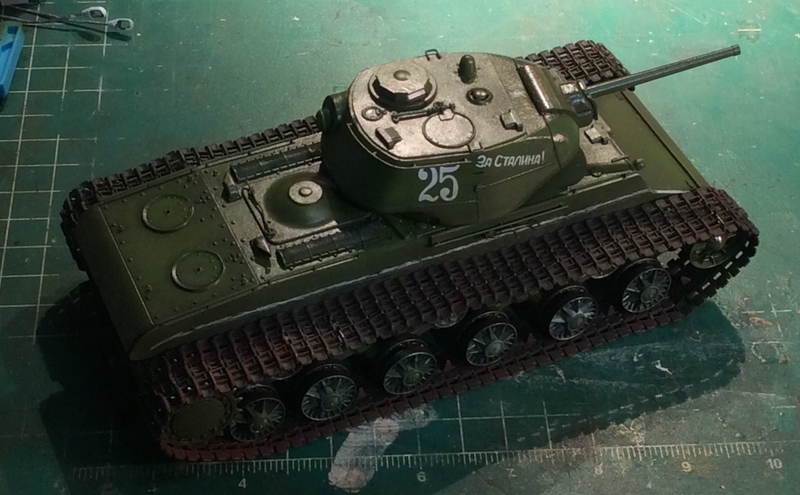 I am calling this one done, Soviet KV-7 Mod 1941. The kit did not come with decals seeing how this design never left the proving grounds. Here are a coupe of final photos. Messing with the basecoat. Bought a Vellejo 4 - BO modulation set and attempted to do it. 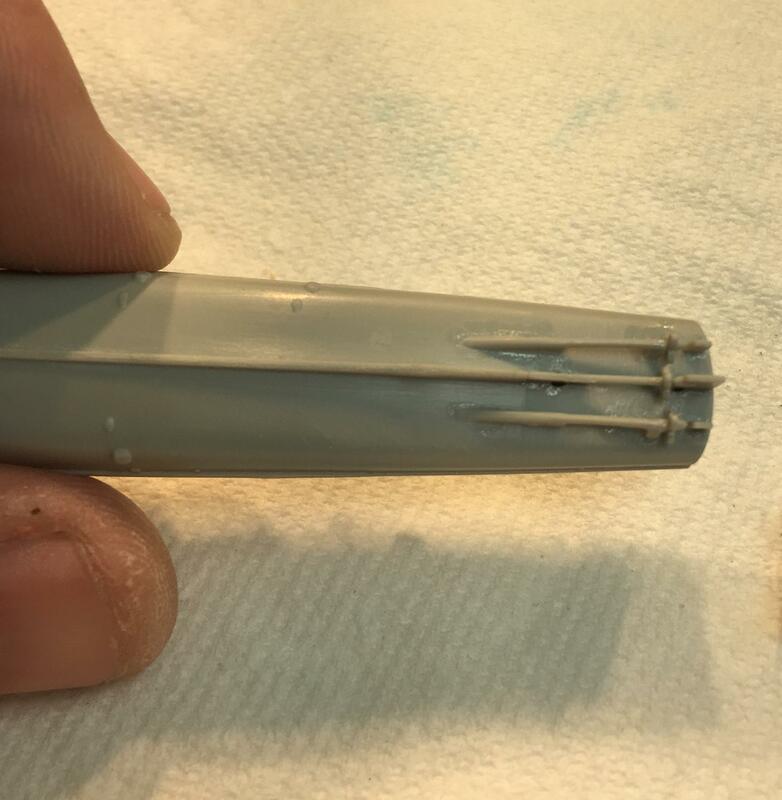 I'm out of practice and my airbrushes were giving me problems. Cutting and cleaning indy links off the sprues now. Subassemblies are just dry fit and in various states of priming/painting. Scott, nice BMO-T, looking forward to your painting and weathering. Peter, same for your Tupolev! Rory, your tiny Schnellboot turned out great! Producing builds + finishes of this quality so quickly is an art in itself. 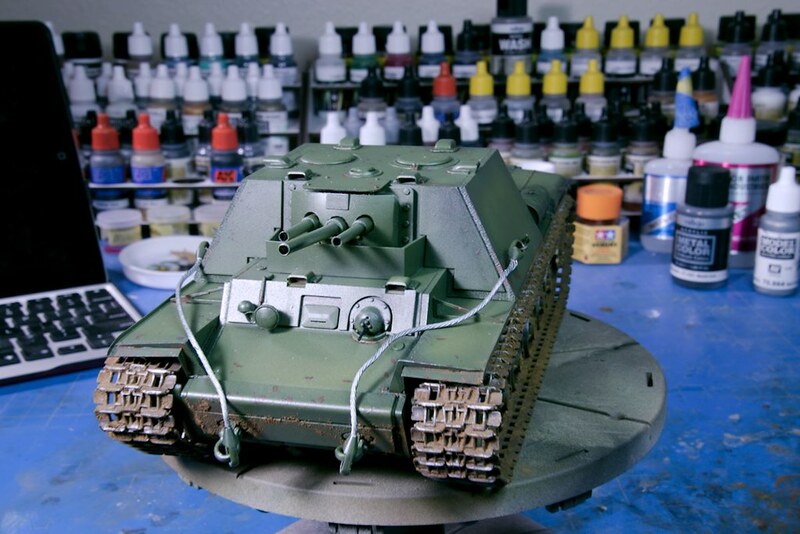 Mark, I really like your KV-7, your very restrained weathering is just right for a proving-ground vehicle. 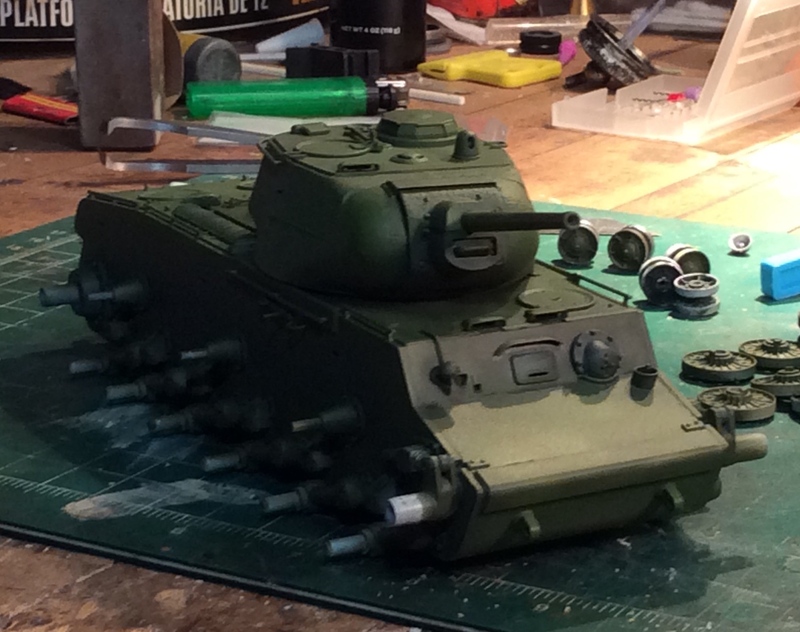 Marc, good job so far on your KV-1S. Even if the color modulation didn‘t turn out the way you wanted it to, once you apply some washes and, if you want, dust it up a bit, nobody will be able to tell - it always amazes me how much weathering changes the hues and intensity of the basecoat. Mark, awesome beast - I love Soviet/Russian eight-wheelers (or, like the Topol, even more) with various massive weapons mounted on the back. That KV 7 is interesting. I didn't know anything about it until i found it on tankarchives.blogspot.com. 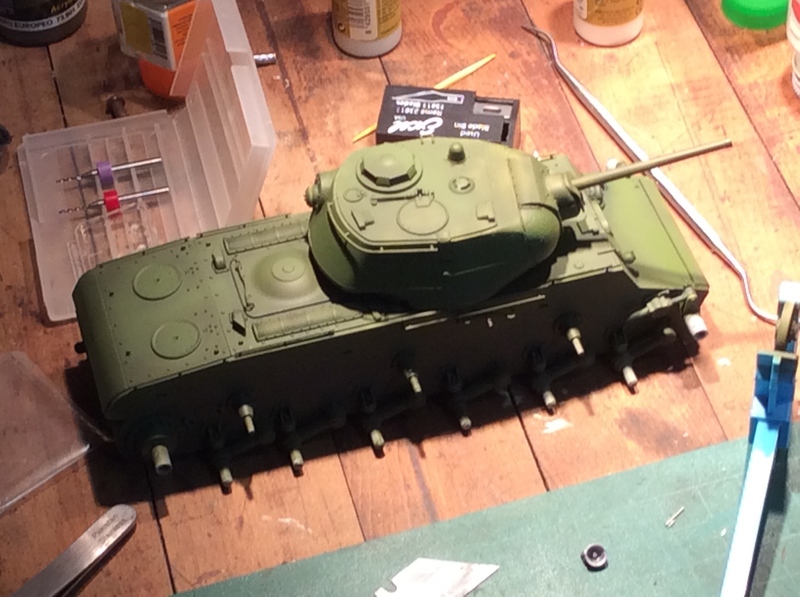 As for my KV-1S, tracks are built, base coated and installed. Glosscoat and decals installed. A quick pinwash and overall dirty wash. I then highlighted the tracks, installed fenders and fuel tanks and some odd pieces i left off. The head light took a flight when i was going to intstall and now need to locate it. I'm a bit late but I'll probably jump in with Trumpy's USMC LAV-25 in 1/35 scale. I should be starting in a few days. 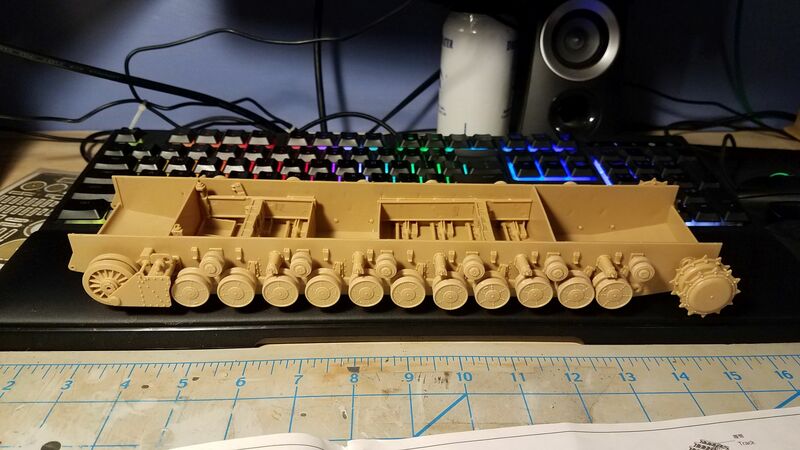 Since I am already halfway through Dragon's K5 Leopold for the Italian Campaign, I figured I would go ahead and build another big gun. It came with a metal barrel from the original owner which I will be using, but otherwise it will be OOB and scavenged bits. 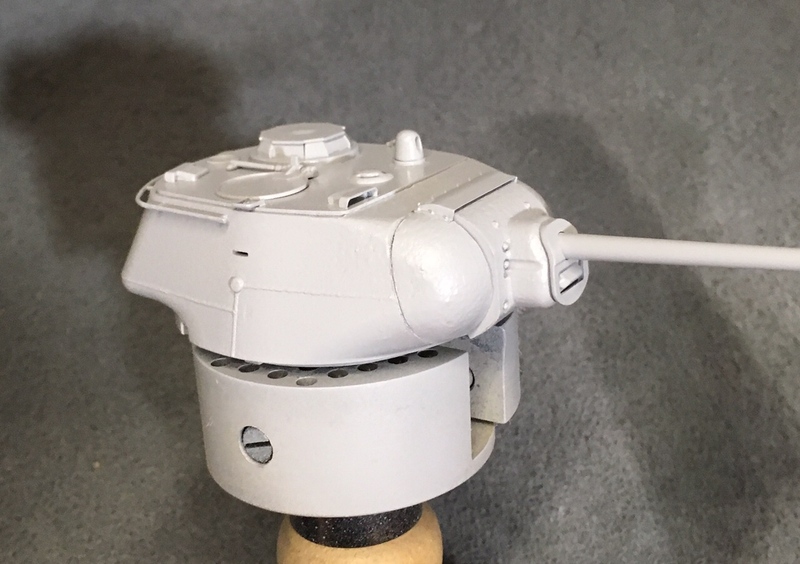 Object 704 has been painted with different shades of IDF Sinai Grey and the Cobra markings applied.